Use a free greenhouse plan to build a backyard greenhouse that allows you to grow your favorite flowers, vegetables, and herbs, all year long. Greenhouses provide seedlings and plants with warmth in the winter and cool in the summer, letting you participate in your favorite hobby every day of the year. 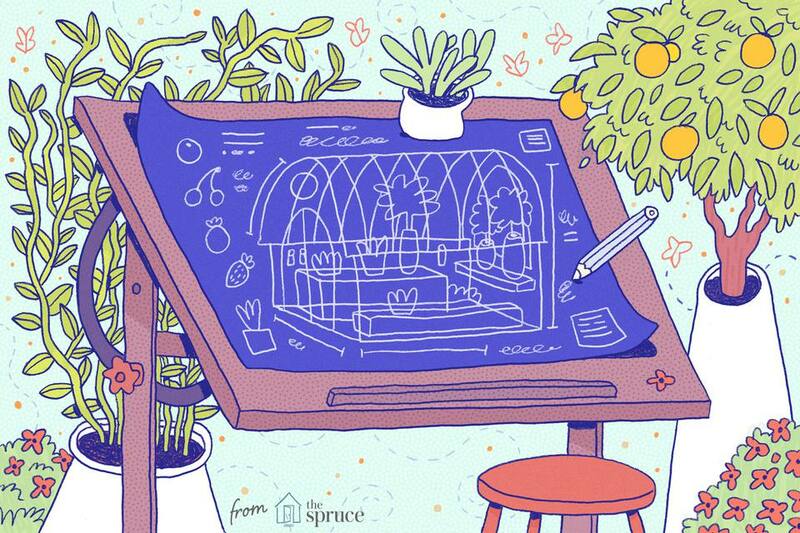 The free greenhouse plans below include diagrams, illustrations, photos, written building instructions, materials/tools list, and everything else you need to build your chosen greenhouse. After you've used one of these free greenhouse plans to build your DIY greenhouse, come back and browse my other free woodworking plans to help you build a shed, picnic table, dog house, pergola, potting bench, cabin, or chicken coop. This free greenhouse plan is for a barn style greenhouse that will help you grow your plants while looking stylish. The free greenhouse plan includes photos, diagrams, a materials and tools list, written instructions, and videos. Northern Homestead has shared their free greenhouse plan for building a GeoDome. Use this plan and you'll get a greenhouse that's lightweight yet secure, absorbs lots of light, has a lot of ground growing space, and one that makes quite the statement. There's a materials list, tools list, written directions, diagrams, and photos to help you build it. They also have other posts on their greenhouse about how to arrange plants within it, how to cover it, how to add a hot water tank, and more. Here's a free greenhouse plan that will build you a greenhouse that only costs you $50 for all the materials. A materials list, construction steps, and building tips are all included in this free greenhouse plan from The Door Garden. If you're feeling ambitious then this free greenhouse plan from Mother Earth News might be just for you. You'll get a completed greenhouse that's solar heated and even has a sleeping loft. Scroll through the pages of this free greenhouse plans to find a materials list, images, and directions for building this great looking greenhouse. Here's a free greenhouse plan by BuildEazy that is conveniently built out of mostly 2"x4"s.
Click your way through the pages of this free greenhouse plans to find shopping lists, directions, and diagrams. There are also photos of the greenhouses built by other readers who have used this plan. How to Specialist has a free wood greenhouse plan that will only take you a few weekends to build. Included in the free greenhouse plans are a materials list, diagrams, tools list, and tips. Instructables has a free greenhouse plan that uses a unique building material - old windows. It creates a great looking structure that's environmental and budget friendly. There are lots of color photos and written instructions to help you build one for your own yard. Here's another free greenhouse plan from How to Specialist. This plan will build a small greenhouse that's perfect for a small backyard. You can use the written instructions, materials and tools list, as well as tips and diagrams, to build this greenhouse. This free greenhouse plan will give you everything you need to build a small greenhouse that's perfect for your backyard. This free greenhouse plan includes lots of diagrams and illustrations along with written instructions. BuildEazy has another free DIY greenhouse plan, this one builds a large 8' by 10' greenhouse that you'll be able to fit all kinds of plants into. There are 13 pages in this free plan that includes drawings, photos, diagrams, and instructions on how to build it. This free greenhouse plan takes some old windows and makes them into a greenhouse just pick enough for a few plants. It's a gorgeous greenhouse that doubles as yard decor. Here's a free plan for an arched greenhouse that's completely built out of PVC pipes. Download the free greenhouse PDF plan and you'll get a material list, diagrams, and written directions. FloridaGardener.com has a nice greenhouse plan that you can print and use for free. A combination of wood and PVC pipes are used to build this large, hooped greenhouse. What Are the Top Varieties for Cut Flowers?